Yasser Arafat is not yet a has-been. His reputation and legend live on to a considerable degree. This is disturbing in itself. But it is also worrying because it means that vital lessons have still not been learned. Arafat’s legend was allowed to grow to the point where most of the American media and virtually the entire European media swallowed it: he was admired, kowtowed to, taken at his own valuation. Unless we understand how this happened, there is nothing to prevent it happening again. Similar legends seem bound to arise, with the same murderous results that Arafat’s had. Arafat created modern terror, promoting air hijacking and suicide bombing, and inspiring many others including, no doubt, the perpetrators of the 9/11 attacks. He committed monstrous crimes not just against Israelis and others, but against his own people. Arafat siphoned away billions of dollars and squandered resources that could have been used productively to build a Palestinian state. His “extortion, payoffs, illegal arms-dealing, drug trafficking, money laundering and fraud” (to quote a 1993 report by British Intelligence) were known about for years. Forbes magazine named him one of the world’s wealthiest leaders. His former finance minister, Salam Fayyad said $900m of western aid money had gone missing. Yet, until almost his last days, it was all but impossible to get major news organizations like the BBC to report on Arafat’s corruption. There are three articles below. The first, from National Review online, was written and published within hours of Arafat’s death being announced. The second, from The Jerusalem Post, was published three days later. The third, a book review for The Wall Street Journal was written a year earlier. They explore how, years after Arab leaders stopped believing a word Arafat said, Western elites continued to fawn over him. Arafat could not have got away with it for so long without so many outside enablers. I believe there are lessons in these articles if we want to prevent future Arafats emerging and acting with near immunity, as this one did for over four decades. Yet until the very end, some prominent Western journalists never stopped heaping praise on him, or covering up for his countless crimes and misdeeds. It didn’t matter how many Jews, Arabs, and others died on his orders, or how many times he let down his own people, or stole from them. For these journalists, as well as for many European governments, he remained a worthy Nobel peace-prize winner and the “sole legitimate representative” of the Palestinian people. To judge by some of the reporting as he lay on his deathbed in Paris – the hushed tone of the television newsreaders, the flattering touched-up portrait photos on the cover of the London Times - Arafat was a figure who deserved to be deeply revered, a kind of ailing pope. There was little mention of the fact that he played a central role in the growth of modern terrorism, and continued to instigate it until the end. That his hijacking of airplanes inspired al Qaeda, that he ruined the modern Olympics by gunning down athletes, that he had a wheelchair-bound American pensioner shot and thrown into the Mediterranean, or that the PLO’s massacre of 21 young Israeli children in their school pre-dated Beslan. 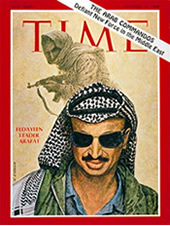 Other prominent Western media, such as the New York Times, have also long sought to downplay Arafat’s dictatorial rule, his endemic corruption, or his close connection to the Al Aqsa Martyrs’ Brigade – the terror group which has rivaled Hamas in the number of suicide attacks perpetrated against civilians in recent years. 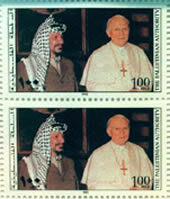 Arafat knew how to turn on the charm with gullible Western reporters. When one American journalist brought his young daughter to meet him in Ramallah shortly after the Al Aqsa Brigades murdered several Israeli children, Arafat spent half the interview playing with her. As recently as last July, the lead editorial of the New York Times was still sanitizing Arafat’s image, referring to him as “a democratically elected leader” and a “romantic” revolutionary. Writing last week on Islam Online (Arafat: The Enigmatic Leader”) Kareem Kamel spoke of the “the cronyism and corruption that have been rampant in the Palestinian territories since Arafat came from exile” and of the disappearance of hundreds of millions of dollars of European Union aid money - news that may be familiar in the Middle East but has rarely been subject to scrutiny in Europe itself. It’s a fair comment, but what should also be said is that nowhere did Arafat find more starry-eyed fans than among some deluded European and North American journalists. And in the Toronto Sun we were told he was “murdered” by Israel. If anyone is still in any doubt that much of the Western media has been taken in by the Stalin-like cult of personality Arafat nurtured for himself over the past 40 years, they shouldn’t be any more - not after hearing or reading the lies, half-truths and distortions that were served up in the 48 hours of virtually nonstop coverage on international news networks following the announcement of Arafat’s death last Thursday. Arafat, we were reminded, was “a leader,” “a politician,” an “inspirational figure.” So, too, is Osama bin Laden, but it is hard to imagine anyone in the Western media covering bin Laden’s death with almost no mention of terrorism and virtually no allusion to his victims. Reading much of the print media, watching BBC and CNN, listening to the even more partisan coverage of BBC World Service Radio (which attracts over 150 million listeners daily) it was as if these acts of terror had never happened. It was as though those Olympic athletes had never been killed, those airliners never hijacked, those schools never bombed, those passengers in airline terminals at Rome, Vienna and elsewhere never gunned down. It was as if the Ma’alot school massacre (of mostly 15-year old girls) had never occurred, or a bazooka had never been fired into a school bus from Moshav Avivim, wiping out an entire class and their teachers. And it was as if an eight-month pregnant mother, Tali Hatuel, hadn’t been shot in the head by Arafat’s Fatah, execution-style, together with her four young children, only last May. In many reports these victims were simply airbrushed from history. When the time comes, will the BBC run 48 hours of virtually nonstop coverage of Colonel Mu’ammar Gaddafi’s death without mentioning Lockerbie? Will they devote 48 hours to IRA leaders with barely a mention that they killed anyone? The timeline put out by the Associated Press, the world’s biggest news agency, and used by news outlets worldwide (titled “Key Events in Yasser Arafat’s Life”), also omitted all acts of terrorism. Indeed we can only wonder what kind of terror AP’s timeline says Arafat “renounced” on December 12, 1988. The Pope’s chief spokesman, Joaquin Navarro-Valls, told us of his “pain” at the passing of the “illustrious deceased.” May God “grant eternal rest to the soul” of “a leader of great charisma who loved his people,” he said, while making no reference to any of those for whose deaths and injuries Arafat was responsible. In round-the-clock coverage we were repeatedly told how French President Jacques Chirac called Arafat “a man of courage and conviction,” and how before his death was announced Chirac had paid homage by kneeling in silence at his bedside. About that there can be no doubt. FOR more than four decades, since he founded Fatah in 1959 and then the Palestinian Liberation Organization in 1964, Yasser Arafat has enjoyed the flattering glare of the international spotlight. Whole generations of generals and peace envoys, a half-dozen U.S. presidents and entire Arab regimes have come and gone, but Mr. Arafat has kept himself in power – even as he has failed his people and pursued policies that have added to their distress. Other Arab leaders have long since stopped trusting him, taking it for granted that he will not honor the agreements he has signed. Egypt’s President Hosni Mubarak once referred to him, in the presence of Secretary of State Warren Christopher, as “a son of a dog.” Mr. Arafat is one of the inventors of modern terrorism and continues to instigate it to this day. Despite this, a multitude of admirers and apologists in the West – and even in Israel itself – have been taken in by his pose of moderation, at least until recently. As a result, he has visited nearly every royal palace and presidential residence in Europe and was a guest of honor at the White House several times. He has even won the Nobel Peace Prize. How did this happen? As Middle East scholar Barry Rubin and his journalist wife, Judith Colp Rubin, show in their admirable, impressively documented “Yasir Arafat: A Political Biography,” he is one of the great con men of modern politics. Even those who know what a slippery character Mr. Arafat is may be surprised to learn from the Rubins’ account just how deceitful he can be. He claims to have been born in Jerusalem, for instance, but was in fact born in Cairo. He has told tales of single-handedly stopping an Israeli tank column in the 1948 war, though the evidence places him in Egypt at the time, far from the fighting. He has stated that he was an officer in the Egyptian army defending Port Said during the 1956 Suez war; the truth is that he was in Czechoslovakia, attending a Communist-sponsored student congress. More broadly, he has alleged that there have been massacres of Palestinians where none have occurred. He has talked of PLO victories when it has suffered heavy losses. Some of his falsehoods in recent years have been utterly fantastic – that there was never a Jewish temple in Jerusalem, that Ariel Sharon is planning to settle 500,000 Afghan Jews on the West Bank. But that hasn’t stopped some journalists from taking them seriously. Part of Mr. Arafat’s success undoubtedly derives from the image he has cultivated. 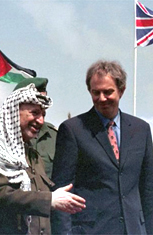 From early on he grasped the importance of public relations and developed personal trademarks that are now world-famous: the stubble beard; the headscarf carefully draped to resemble a map of Palestine (including the whole of Israel); the military uniform, which he has insisted on wearing even at peace-signing ceremonies, as if he had come straight from the battlefield. And Mr. Arafat knows how to turn on the charm. When an American journalist brought his little daughter to meet him last year in Ramallah (shortly after Arafat’s Al Aqsa Brigades murdered several Israeli children), the Palestinian leader spent half the interview playing with her. But beneath the apparent warmth is ruthlessness. 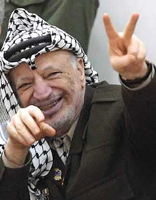 Mr. Arafat has never hesitated to order violence or to encourage it, including violence between different Arab groups. He has worked on the assumption – a correct one, as it turns out – that while exasperated Arab leaders might wash their hands of him, the Americans whom he has so much reviled will step in to save him. This was as true in Beirut in 1982, when Mr. Arafat was allowed to flee to Tunis, as it was in April of last year, when Secretary of State Colin Powell rushed to Mr. Arafat’s Ramallah compound to help pressure the encircling Israelis to back away from expelling him. In general, experience has taught him that, far from marginalizing him – as foreign leaders have repeatedly warned him it would – terrorism pays. Already by November 1974, the PLO’s record had included plane hijackings, letter bombs, the assassination of America’s ambassador to the Sudan and of Jordan’s prime minister, the Olympic Games massacre, the slaughter of 21 Israeli schoolchildren at Maalot and 52 Israelis – mainly women and children – in Kiryat Shmona. That was the month in which he was invited (by a vote of 105 countries to four) to address the United Nations General Assembly. As for political tactics, the Rubins remind us, Mr. Arafat is often astute, positioning himself between competing Islamic, Marxist and nationalist Palestinian groupings. From as early as the 1950s he had contacts with both the KGB and the CIA. One of his closest allies was Saddam Hussein, yet Mr. Arafat was the first foreign leader to visit Tehran after Khomeini seized power in 1979. (He arranged for Khomeini’s son to receive training at a PLO camp in Lebanon.) Even today, though the Western media talks of a “new Palestinian prime minister,” Chairman Arafat retains control of almost all the key elements of power in the Palestinian political arena and security services. But what has it all added up to? Misery, strife and murder, among much else, and stalemate. The Rubins, along with documenting his corruption and misrule, make clear how much Palestinians and Israelis alike have suffered from his refusal to entertain, with any sincerity, a two-state solution to the crisis in the Mideast. But then he may fear, with some reason, that ending the Palestine conflict will end the fawning attention of the world’s elites and his grip on power.